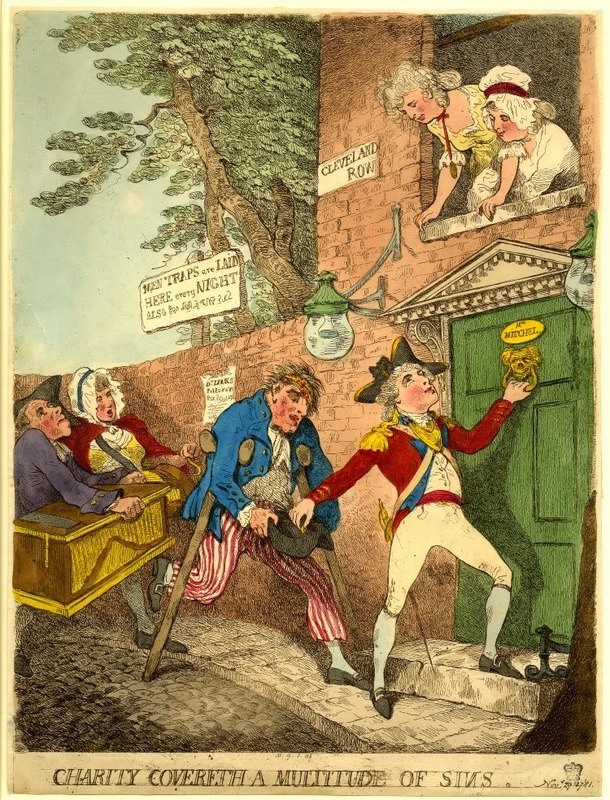 Charity Covereth a Multitude of Sins, Thomas Rowlandson, 1781, British Museum. A brisk young army officer knocks at the door of a bawdy house, gazing up at a pair of women as he drops a coin into the hat of a wanting sailor. The title suggests his giving is merely to impress the women, but he himself may be taken in. Beside the house is a sign warning "Men Traps a Laid Here Every Night." Perhaps the word "laid" carries more weight for the officer than the word "traps." 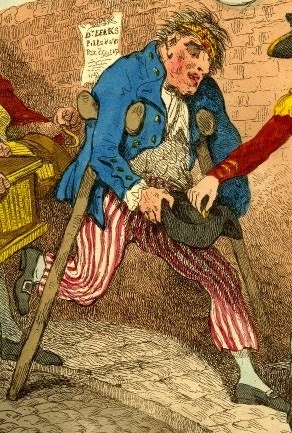 Balanced on his crutches, the sailor in this piece holds forth his black hat, though the cut of it makes it difficult to determine if it is a cocked hat or a round hat. His double blue short jacket has slash cuffs and brass buttons all around. He is without a waistcoat, wearing only a white shirt. The red dotted yellow neckcloth is fitted about his head, presumably to cover some wound. Ending above the ankles, his trousers are red striped. Pointed toe shoes fitted with rectangular buckles finish off his slop clothes.